On the second day of MAKS 2017 Russia’s United Aircraft Corporation and State Transport Leasing Corporation (known by its Russian acronym GTLK) signed a letter of intent for the delivery of 50 Ilyushin Il-114-300 regional turboprops. The parties will conduct a series of bilateral meetings to discuss the promotion and sales strategy for the airliners. They also have to define the terms and conditions of delivering the aircraft to potential customers and financing such deals, as well as the pricing policy. Partial government funding of future deliveries will be available in the form of increasing GTLK’s capital. Feasible delivery times are also to be discussed. The preliminary agreement will be finalized before the end of the year. 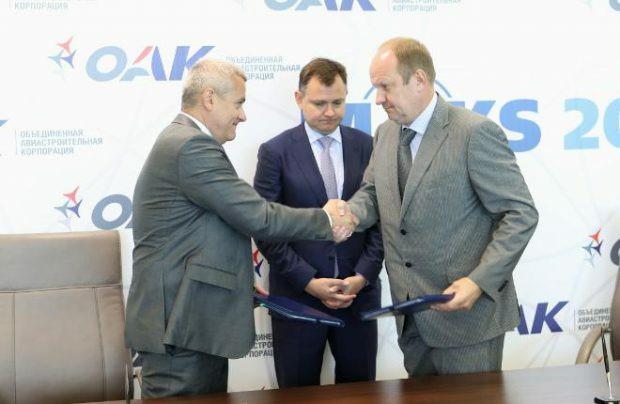 “It is important that the program to promote the new aircraft includes leasing and aftersales support at reduced rates, which are actually comparable to the aircraft’s design costs,” GTLK CEO Sergey Khramagin said. The decision to upgrade the type and relaunch its production was made in May 2016.